windscreen and side front windows. turn knob (D) to . After demisting/defrosting, operate the controls to restore the required comfort. Press to turn this function on. 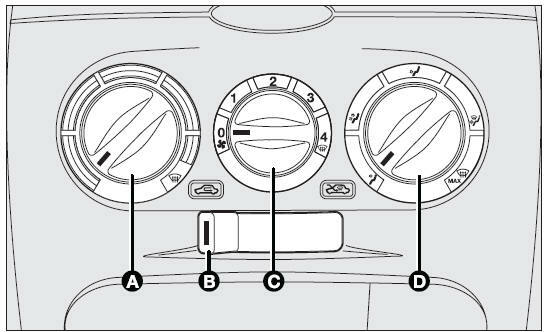 Activation is indicated by the turning on of the warning light on the instrument panel. This function is timed and switches off automatically after 30 minutes. To cut out this function press again button . IMPORTANT Do not apply stickers on the inside of the rear window over the heating filaments to avoid damage that might cause it to stop working properly. Move slider (B) to . This function is particularly useful when the outside air is heavily polluted (in a traffic jam, tunnel, etc.). However, it is better not to use it for long periods, especially if there are several people in the car. IMPORTANT The inside air recirculation system makes it possible to reach the required “heating” or “cooling” conditions faster. Do not use the air recirculation function on rainy/cold days as it would considerably increase the possibility of the windows misting inside.